The first authorized ferry on the lower Cape Fear River was established in 1727 in the town of Brunswick on the western shore to the “upper haulover” on the eastern shore (later known as Federal Point) [today, Carolina Beach State Park], where small craft were transported overland from the river to the ocean. The Brunswick ferry was sometimes referred to as the “Ferry to the landing at Big Sugar Loaf”. On June 3, 1725, Maurice Moore was granted 1,500 acres of land on the west side of the Cape Fear River. Of this tract, 320 acres were set aside and a portion divided in half-acre lots to be developed as the town of Brunswick. From the time of its founding until the American Revolution, the town served as a political, social, and commercial center of the lower Cape Fear region. To facilitate travel between the ocean and the interior of Brunswick County, the general court met at Edenton on March 27, 1727, and determined that a ferry was needed over the Cape Fear River. The general court authorized Cornelius Harnett Sr. to keep a ferry “from the place designed as a Town on the West side of the River (Brunswick Town) to a place Called Haulover, and that he receive the Sum of five shillings for a man and horse and a half Crown for each person”. Harnett purchased in June 1726 from Col. Maurice Moore two lots, Nos. 22 and 23, within the town of Brunswick for £2 each. Those lots, located in the southern portion of the town near the river, were to be improved within eight months by the construction of two habitable houses not less than by 20 feet in size. It was from this location that Harnett operated the ferry across the river to the Haulover near Sugar Loaf. About 1725, in addition to the site of Brunswick Town and adjacent areas, Col. Maurice Moore also acquired by grant extensive land holdings on the opposite or eastern side of the Cape Fear River. Moore’s seaside property comprised 2,640 acres that extended from Landgrave Thomas Smith’s lands northward along the barrier beach and sounds approximately 12 miles to a point just below the present Masonboro Inlet. On April 21, 1736, Colonel Moore sold to Col. Thomas Merrick for £500 the large tract of land that became known as the Haulover plantation and a portion of the property to John Porter. Merrick called the plantation “Hall Over” in a security bond issued to Richard Moorescroft six days later. While Merrick was probably a longtime resident at the plantation, there is no indication that Moorescroft ever resided at ‘The Haulover’. Perhaps Moorescroft simply held the land in trust for Merrick, inasmuch as Merrick’s heirs owned the property a few years later. 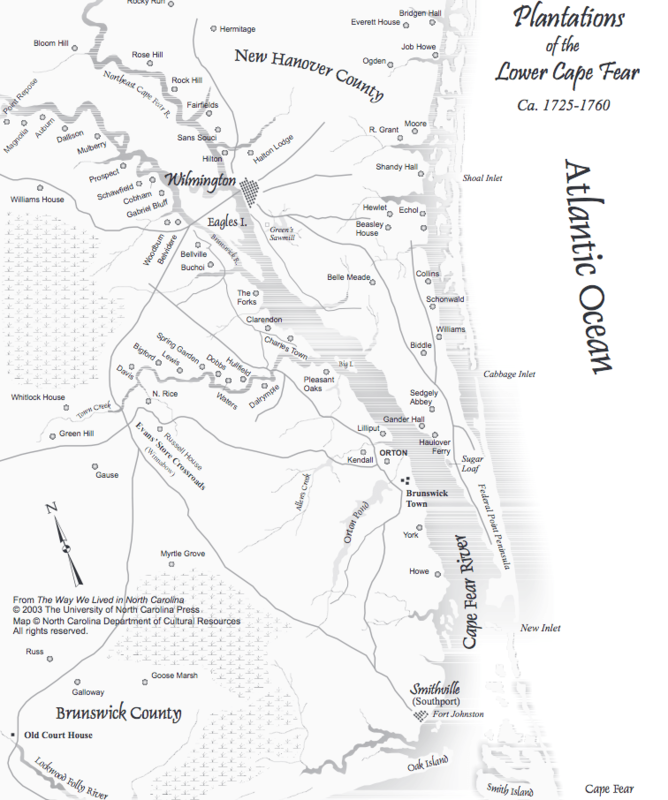 The Moseley map (1733) shows the eastern ferry landing located just below the mouth of a stream that much later came to be known as Telfairs Creek [now Carolina Beach State Park]. This ferry to the landing at Big Sugar Loaf on the opposite side of the river, a distance of more than 2 miles, connected with the only road to the northern part of the province. Surviving records indicate that Cornelius Hamett Sr. surrendered the operation of the Brunswick ferry in the mid-1730s, possibly as early as 1733. His successor was the mariner Capt. Edward Scott, who purchased lot 29 at Brunswick from Nathaniel Moore during that year for £700. Scott’s employment as a ferry keeper apparently lasted only a few years, for in March 1738 the New Hanover County Court accepted his resignation. On June 13, 1738, the court appointed Thomas Merrick “to take the Brunswick Ferry” after the resignation of Scott. Merrick operated the ferry until September 1740, when the court also accepted “the resignation of Col. Meerrick as a Ferry Keeper at Brunswick ordered to become effective within a month after this Court,” provided it could find a proper person to keep the ferry. On June 12, 1741, permission to operate the Brunswick ferry was granted by the court to Roger Moore, who undoubtedly employed others for at least two years to carry out the actual duties involved. From 1743 until at least 1748 John Maultsby operated the ferry. Maultsby came to the lower Cape Fear in the late 1730s from Pennsylvania, where he had previously operated a river ferry. He purchased a 320-acre tract of land on the east side of the river just upstream and across from Brunswick Town. By 1761 a new tender, Darby Eagan, had commenced operation of both an ordinary and the Brunswick ferry. In September 1760 the court ordered all ferry keepers in New Hanover County to maintain at least two boats to each ferry. By 1765 Darby Eagan had evidently remained at his ordinary in Brunswick Town, while his wife Elizabeth stationed herself on the opposite shore for the convenience of travelers. For the next four years Darby Eagan maintained the Brunswick ferry and continued to operate his ordinary. He then sought to improve his fortunes by assuming responsibility for ferry service in the larger and more prosperous town of Wilmington. On October 6, 1769, the New Hanover County Court denied Eagan “the keeping of the ferry over to Brunswick any longer, because he had engaged himself at the Wilmington ferry”. The Brunswick ferry remained in operation with a new keeper until at least 1775 and it is highly probable that it continued to operate until early in 1776. By the end of March of that year, however, British warships present in the lower reaches of the Cape Fear River, along with well-armed troops placed ashore, carried out sporadic raids against Brunswick Town and the surrounding countryside. It was probable during these early months of 1776 that the inhabitants of Brunswick permanently abandoned the town. It is also probable that the Brunswick ferry was forever discontinued during that period. 1986″ A History of the Brunswick Ferry“. Manuscript on File, Underwater Archaeology Unit, Kure Beach, North Carolina. 1973 “Early New Hanover County Records”. Wilmington, North Carolina: Published by the author. Various years. Wilmington, North Carolina. 1886 “The Colonial Records of North Carolina“. Raleigh: The State of North Carolina, 1886-1890. 1960 “Colonial Brunswick 1726-1776“. State Department of Archives and History, Raleigh, North Carolina.